From 95 to 105 € the night I book ! 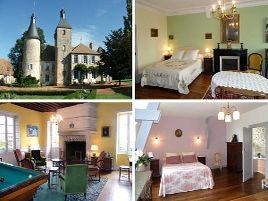 In the heart of the Bocage de l'Allier area, the Château de Clusors, which has been in the same family since 1844, is situated near Moulins. This large family house is furbished with furniture of the family's ancestors with an added modern touch, creating a warm and welcoming interior. The rooms, on the upper floor, afford views of the surrounding Bourbonnais countryside and fully benefit from the peace and quiet of the setting. Carefully prepared breakfasts, a pleasant start to the day. A kindly welcome with a wealth of useful addresses, local information and the history of Clusors to impart..
- des chemins de randonnée à pied ou circuit en voiture avec visites d'églises romanes sont proposés. - golf Les Avenelles à Toulon-sur-Allier à 20 km. 2 rooms with bath or shower, WC and TV. 105 euros (2 pers.). Extra bed 20 euros. RN 7 à 8 km. Entre Moulins et Bourbon l'Arc. The closest station is Moulins, located at 14 km. The closest airport is Clermont-Ferrand Auvergne, to 90 km. des chemins de randonnée à pied ou circuit en voiture avec visites d'églises romanes sont proposés.